We would like to introduce to you to three new team members who joined us recently – Ashleigh, Denisa and Elisa. Ashleigh is an Oral Health Therapist and Hygienist and joins our wonderful hygiene team. Ashleigh graduated from the University of Queensland in 2013 after completing her Bachelor of Oral Health and has since worked in both public and private dentistry. She brings a wealth of knowledge to the team and is passionate about helping her patients maintain good oral health. Outside of work Ashleigh and her husband enjoy travelling, dining out and keeping fit. If Denisa and Elisa look a little familiar, it’s because they are the sisters of Tabby who works with Dr Morrison, and Anna, who used to work with Dr Lillicrap. 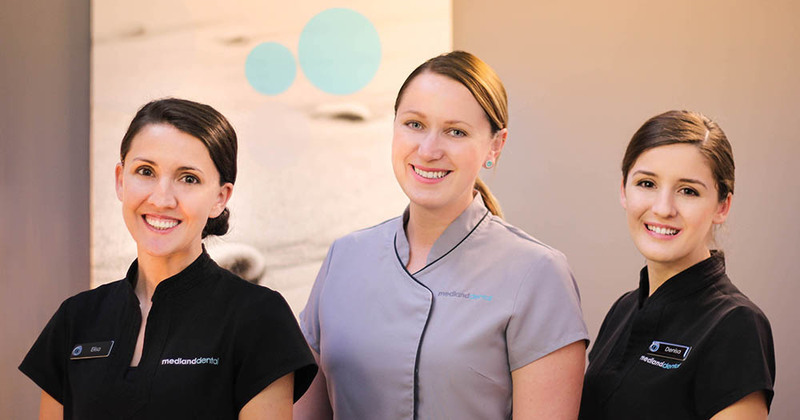 We are lucky to know such a lovely, and talented family of Dental Assistants working with Medland Dental. Elisa has 10 years experience in the dental industry and is passionate about ensuring her patient’s comfort. Elisa spends her free time with her husband Lucian, looking after their three boys and exploring the great outdoors. Denisa has 5 years experience in dentistry and loves getting to know patients and helping them to enjoy their visit. She recently married the love of her life, Emanuel, and together they enjoy traveling and trying new restaurants.